This small table is part of the Gong collection of refined furniture pieces suitable for a modern interior of any size. Its sophisticated and Minimalist silhouette is made up of a structure in bronze with a smooth finish and topped with decorated glass with striking linen inserts. The effect is unique and will adorn a contemporary setting while also providing useful display surface on any occasion. Other measurements available are: 40 x 40 x H 45cm, 60 x 60 x H 45cm, 80 x 80 x H 45cm (with shelf underneath), and 60 x 45 x H 60cm. 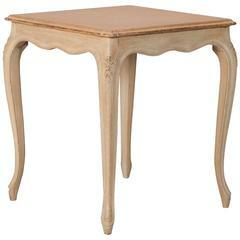 This small side table originates from Spain, circa 1810. Measurements: 17.25'' D x 30'' W x 26.75'' H.
This small Spanish side table is made of walnut, circa 1880. Measurements: 16.5'' D x 23'' W x 21.25'' H.
French square side table with painted top and contrasting bleached wood legs and apron with carved floral details, circa 1930s. 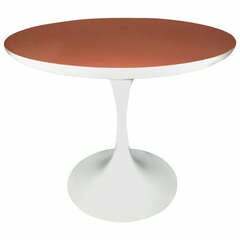 Saarinen design 1960s orange Formica top tulip petite table unsigned, looks to be all original vintage.